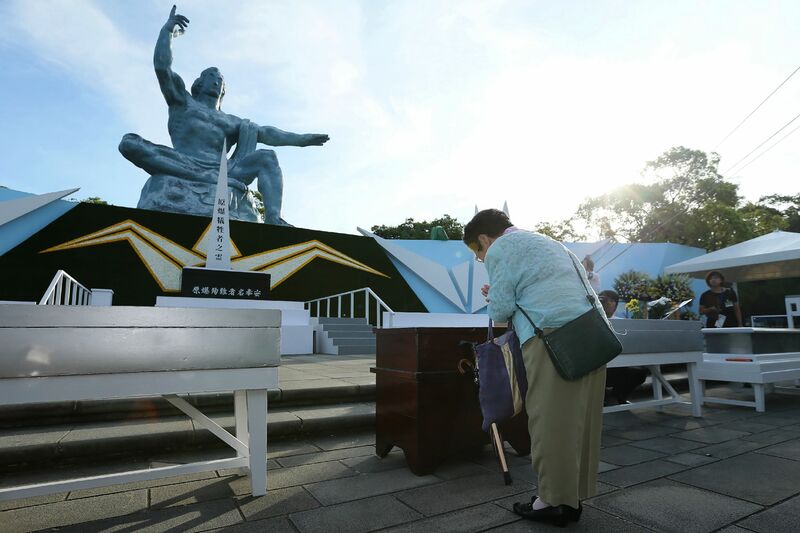 NAGASAKI - Nagasaki marked the 73rd anniversary of the U.S. atomic bombing of the city Thursday, with its mayor calling for security policies not reliant on nuclear deterrence and pressing Japan to fulfill its “moral obligation” to lead efforts toward a nuclear-free world. Mayor Tomihisa Taue, in his peace declaration, urged the government to support an international treaty banning nuclear weapons, adopted last year. “I hereby ask that the government of Japan, the only country to have suffered from the wartime use of nuclear weapons, support the Treaty on the Prohibition of Nuclear Weapons and fulfill its moral obligation to lead the world toward denuclearization,” Taue said during the ceremony held at Nagasaki Peace Park. The declaration also called on global leaders not to forget “the resolve” of the first U.N. General Assembly resolution to aim for the elimination of nuclear arsenals. U.N. Secretary-General Antonio Guterres was in attendance, becoming the first sitting chief of the international body to attend the annual event. A moment of silence was observed at 11:02 a.m., the same time the plutonium-core atomic bomb “Fat Man,” dropped by a U.S. B-29 aircraft, exploded over the city on Aug. 9, 1945, in the closing days of World War II. The bomb, which followed one dropped on Hiroshima three days earlier, killed an estimated 74,000 in Nagasaki by the end of that year. “To the great concern of those in the cities hit by atomic bombs, a shift toward openly asserting that nuclear weapons are necessary and that their use could lead to increased military might is once again on the rise,” according to the declaration. The ceremony comes amid expectations for progress on North Korea’s denuclearization. The Nagasaki mayor said his city and Hiroshima have great expectations for “irreversible denuclearization,” urging the government to seize the opportunity to create a nuclear-free zone in Northeast Asia. 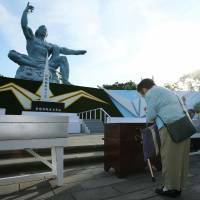 Atomic bombing survivors and visitors prayed for lasting peace, and representatives from 71 countries were in attendance. During his speech, Guterres called on all countries to commit to nuclear disarmament and make “visible” progress with urgency. “Disarmament processes have slowed and even come to a halt,” Guterres said, as the adoption last year of the U.N. treaty demonstrated the frustration felt by many states. The U.N. chief expressed solidarity with hibakusha, who have been among the strongest advocates for peace and disarmament. “They are defined not by the cities that were destroyed, but by the peaceful world they need and seek to build,” he said. Nagasaki resident Kiyomi Fukushima, who was 5 years old at the time of the bombing, still recalls seeing black rain falling from the sky and feeling scared. “We have enjoyed peace for the past decades and I hope it will continue. Somehow the world feels less safe and it’s frustrating,” Fukushima, now 79, said after visiting the park early in the morning. Prime Minister Shinzo Abe vowed to make strenuous efforts toward the goal of achieving a nuclear-free world. “In recent years, differences in the approaches of various countries on nuclear disarmament have become evident,” Abe said in his speech, adding that Japan will serve as an intermediary between nuclear powers and nonnuclear states. An accurate understanding of the tragic realities of the atomic bombings and cooperation from both parties is essential, he said. As of March, the number of living hibakusha stood at 154,859, with an average age of 82.06. “My mother used to come to the park every year for the ceremony but she can’t anymore” due to her age, said Nagasaki resident Naomi Maeda, 51, whose mother is a hibakusha. “It’s our turn to keep peace,” she said.